In der Staatsoper brillierte die Bulgarin Elena Filipova als “Aida”- einer der hellsten Sterne am Sopran Himmel. Sie brachte nicht nur die temperamentvollste Dramatik mit, sondern auch einen lyrischen Schmelz der bis in traumhaft leistete Tongebungen reichte. Und da sie schön anzusehen ist und auch schauspielerisch hinreissend agierte, war sie eine perfekte Aida. Before the opening of Eugene Onegin, the Opera Company of Philadelphia’s final production, people were talking with anticipation about young Canadian Gino Quilico, who sings the title role. Quilico is quite good-slim and handsome too- but the name that should be on everyone’s lips is that of Elena Filipova, who sings Tatiana. Filipova is a Bulgarian making her American debut, and a more appropriately sensitive Tatiana would be hard to imagine. She too is young, slender and physically attractive. The thwarted lovers she and Quilico create have a credibility that heightens the era’s naturalism, while their voices, big and full of character, do justice to this tragedy of lost opportunities. Filipova uses her voice with a great deal of lyrical imagination. 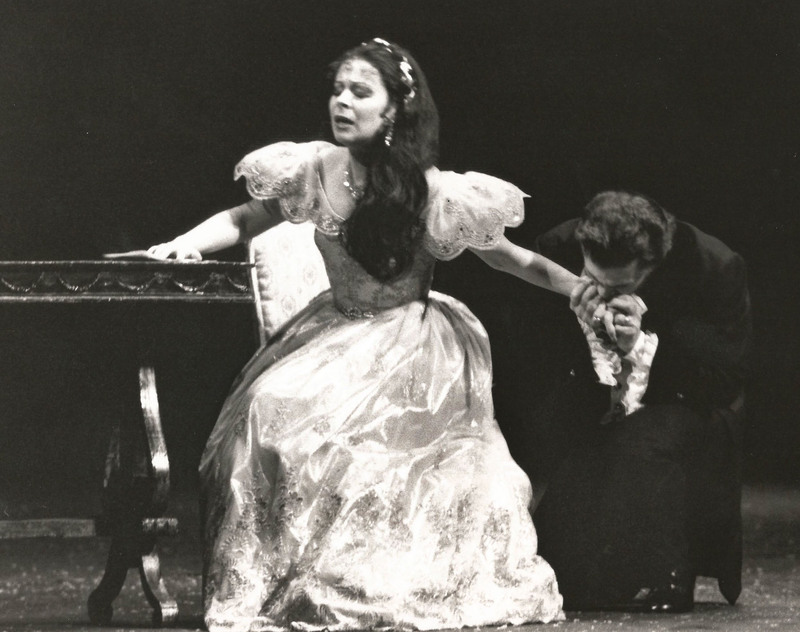 During the letter scene in which Tatiana confesses her love for Onegin, it was tempting, but fruitless, to count the many ways in which her singing conveyed the mercurial symptoms of lovesickness. Fear, dreaminess, anxiety, shyness, exhilaration- all were evoked by a slight hesitation of a phrase or by gradations of pianissimo singing that reached the most touching levels. Filipova has sung Verdi in Major Opera houses in Germany, Austria and Italy in recent years. Earlier this month she sang the title role in Aida for Opera Pacific. This evening, she sings her first Verdi heroine at the Academy of Music when she opens the Opera Company of Philadelphia’s season as Leonora in Il Trovatore. Leonora is a passive figure fought over by the troubadour Manrico and his brother Count di Luna. Filipova says she enjoys the challenge of spinning out Leonora’s long breathed melodies but wishes her character were more dramatic. “She is suffering, suffering, and suffering” says the soprano of the Spanish noble woman who is rescued from a convent by her lover and then swallows poison to save his life. A Handsome woman with dark brown hair and flashing eyes, Filipova comes from a musical Family. Her father, she says, is an orthodox priest with a “wonderful dramatic tenor voice”. Her mother has Greek and Italian blood and also has a fine singing voice , Filipova’s sister is a pianist. After studying in the conservatory of Sofia, Filipova arrived in Germany “with a little luggage, ten marks and a contract” to be a professional opera singer. Filipova made her debut with OCP two seasons ago as Tatiana in Tchaikovsky’s Eugene Onegin. Since then her career has accelerated. She recently made her debut at the Vienna State Opera and returns to sing Puccini’s Manon Lescaut this season. 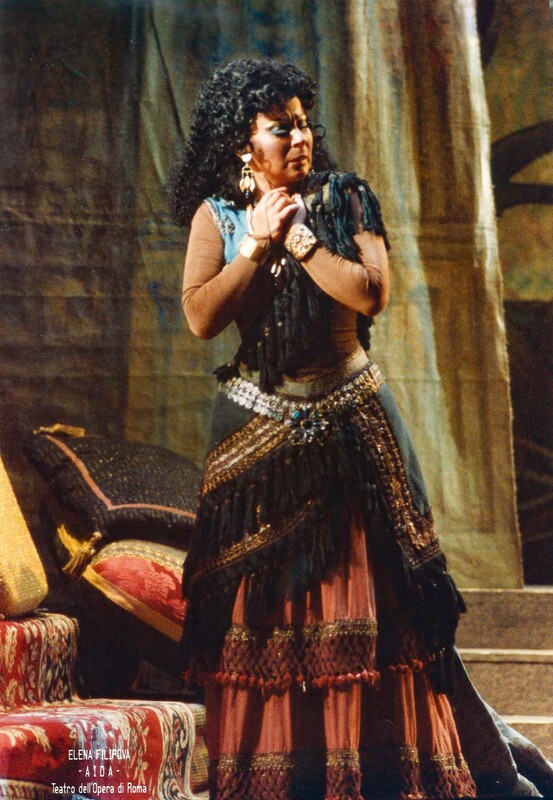 Last year, she sang the title role in Franco Zeffirelli’s production of Aida in Rome and then sang in Gian Carlo Menotti’s production of Manon Lescaut at the Rome Opera. 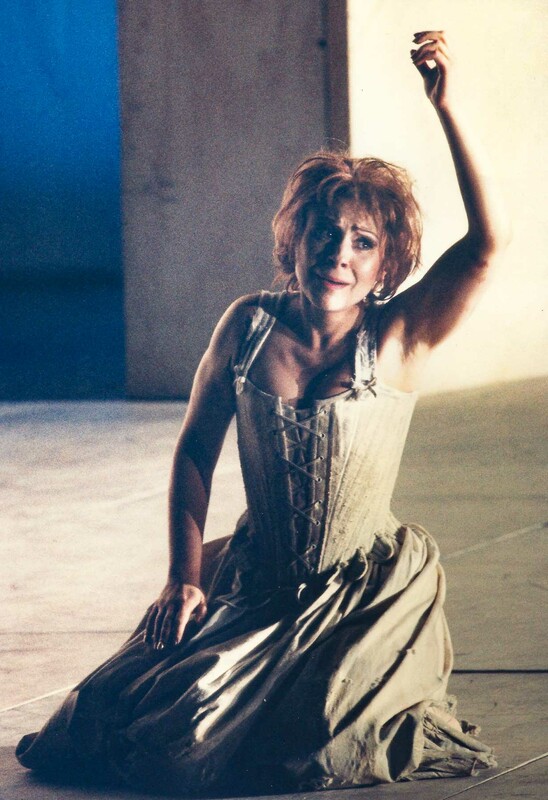 Last summer, Filipova made her debut at the Bregenz Festival in the title role of Zadonai’s Francesca da Rimini. In the upcoming season, she returns to the Opera Pacific in the title role of Madama Butterfly and sings her first Tosca in Catania Sicily. Filipova savors the chance to sing Puccini’s emotionally compelling heroines but still insists Verdi is her first love. She has sung in La Traviata, Simon Boccanegra, Otello, Don Carlo and Aida .She dreams of singing La Forza del Destino. “Verdi wrote 26 operas, so there arena lot of possibilities” Says Filipova. “I think my voice is right for Verdi. The dark color of my voice is a big gift from God. For the Philadelphia Trovatore, conductor Maurizio Barbacini is opening a cut in the last act which enables Filipova to sing an exciting cabaletta with an explosive melody. Elena Filipova is Tatiana and Gino Quilico is Onegin in the Opera Company’s staging of Tchaikovsky’s tragic tale. …And despite Manon Lescaut’s odd road-movie come-morality tale storyline the music is classic Puccini. 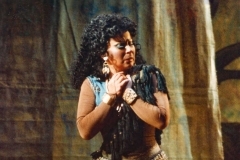 Bulgarian soprano Elena Filipova played the beautiful but fatally Manon particularly well. She was not only a believable character on stage- something which is not easy to pull off during some of the odder moments in the plot- but also has a stunning seductive voice. Her rendition of In Quelle Trine Morbide which is the party piece from this show was brilliantly executed.